Although commonly called ‘surfer’s eye’, pterygium can actually affect anyone and it is particularly common among people who spend a large amount of time outdoors. It manifests as a pink, fleshy growth that can look quite alarming, and many sufferers worry that it is cancerous. However, this is not the case and while pterygium may be an annoying condition, it is not a serious one. Where do pterygium growths appear? Pterygium growths are found on the clear tissue that covers your eyeball and lines your eyelids. They normally begin on the side of your eye nearest your nose and spreads outwards towards the center of your eyeball. While some people experience extremely slow growth, others may find that the growth extends quite quickly and can obscure a large part of their eye and cause difficulties with their vision. Growths can be in one eye or both, and when in both the condition is known as bilateral pterygium. In many cases there are no symptoms of pterygium and the growth appears without warning. However, those sufferers who do experience symptoms have reported that their eyes feel itchy, gritty, like they are stinging or burning, like they have something stuck in them, or look particularly red or watery. Sometimes pterygium is preceded by a condition known as pinguecula. The main symptom of this is a yellow colored bump on your conjunctiva. Exposure to irritants such as dust, sand or wind. Excessive exposure to ultraviolet light without adequate eye protection. Treatment for pterygium depends on the severity of your condition. If it is relatively mild, then your optometrist or doctor will probably recommend over-the-counter eye drops or ointments which will ease any discomfort and reduce the redness. If these are not effective, you may be given prescription steroids. 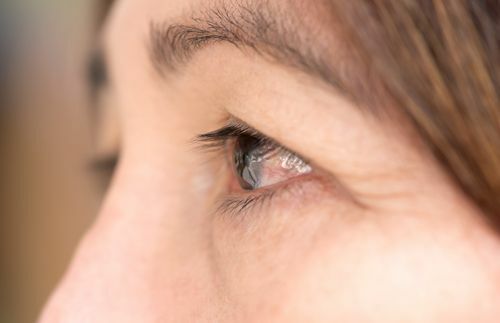 If your condition is more severe, causes you pain, discomfort or severely compromises your vision, then surgical intervention may be appropriate. This is usually done in a day-visit to your local hospital and involves the removal of the growth under local or general anesthetic. The procedure takes around 45 to 60 minutes and you will be able to return to work in just a few days. Whilst the surgery can remove the growth in its entirety, it is not always a permanent solution. In some cases, patients have reported that a more aggressive growth has returned in its place. Other risks that you should be aware of include scarring of the cornea and astigmatism as a result of the procedure. Preventing pterygium is far better than trying to treat it. By wearing sunglasses that block at least 99% of both UVA and UVB rays as much as possible (even on cloudy days! ), you can help protect your eyes from this condition. Wraparound sunglasses are the best option as they can stop rays from sneaking in the sides of your vision. You can also consider putting tints on your car windows, wearing a hat with a large brim and avoiding direct sunlight when the UV rays are at their strongest.